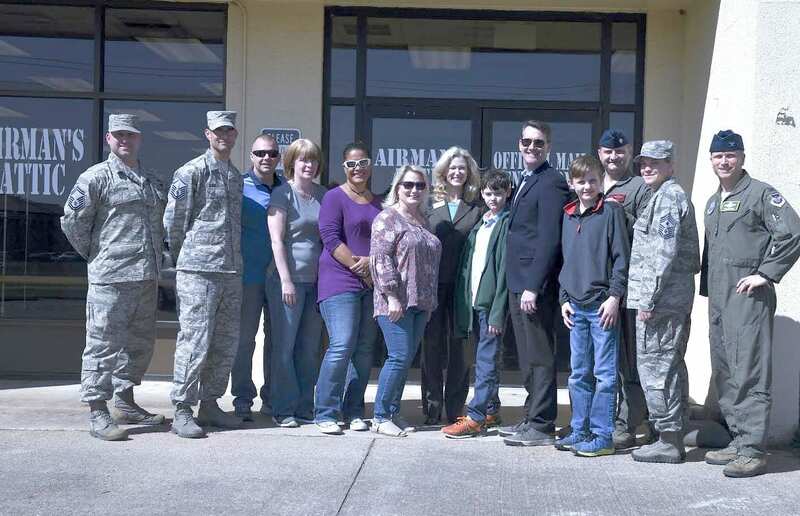 The Airman’s Attic located at Barksdale Air Force Base received a generous donation of $5,300 earlier this spring for a new outdoor storage unit. The Attic, as it is commonly referred to, is a thrift shop for military members. Donations of items come from fellow Airmen as well as donors from the community. Stephanie Markin, the wife of a 30-plus-year military veteran, runs the Attic. She said the storage unit was damaged and a lack of funding prevented repairs. David Kaplan, of the Kaplan Public Service Foundation, heard about the need for a major upgrade to the Attic, which he said was a store unlike anything he had come across at other military bases. Interested, he flew to Bossier and met with Markin. She showed him the failing storage shed and told him how much they needed to replace it. Markin hoped that they might pay for half of it. Kaplan and the Public Service Foundation ended up paying for the entire unit. “It’s just been a huge blessing. I don’t know how we got so lucky,” Markin marveled. “It’s funny because it’s just a shed. But for myself and some other sponsors who are here constantly because we believe in this so much! She noted the new unit is twice the size and that because it’s water tight, people can drop off items safe in the knowledge that it’s going to be in good shape. The Attic is run by volunteers only, and welcomes interested community members to consider getting involved. Volunteering at the Attic takes a certain level of commitment. Community members with items for the home, clothing or good for the food pantry are encouraged to drop items off at the Airman’s Attic on 431 Wilbur Wright Boulevard. The shop opens weekly on Tuesdays from 11 a.m. to 3 p.m. and Thursdays from 2-6 p.m. For more information or those interested in volunteering can call (318) 456-2400.